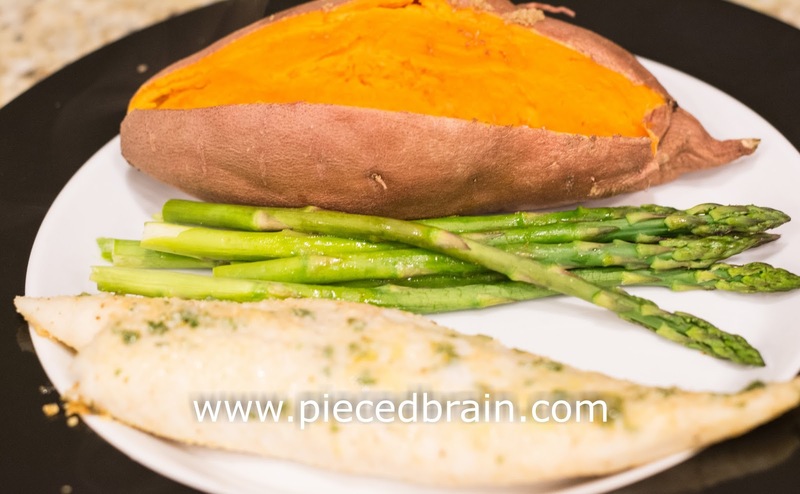 For our dinner last night I prepared Tilapia fillets using a new recipe I had just found online. I read the recipe, shut down the laptop, and went to the kitchen. The fish was defrosted so I grabbed a pie Pirex dish (my preferred dish for dredging food). In went the Parmesan cheese, then the Paprika (or so I thought). I was surprised when I realized I was pouring Old Bay seasoning instead of Paprika (the tin cans looked alike from above when I reached for the seasoning on my lazy Susan!). Oh, well. I added fresh chopped parsley and mixed it all up. After rinsing the tilapia, I dredged it on the cheese mixture, arranged it on a cookie sheet lined with parchment paper, drizzled olive oil, and put it in the oven. The asparagus I was going to roast had had their tough bottoms snapped off and had soaked in water to remove the sand. After draining the water, I prepared another cookie sheet with parchment paper, arranged veggies in one layer on it, drizzled olive oil and seasoned with salt, pepper and cumin. Into the oven they went. Preheat the oven to 400 degrees Fahrenheit (200 Celsius). In a shallow dish, combine the cheese, Old Bay, and parsley. Dredge fish in the cheese mixture. 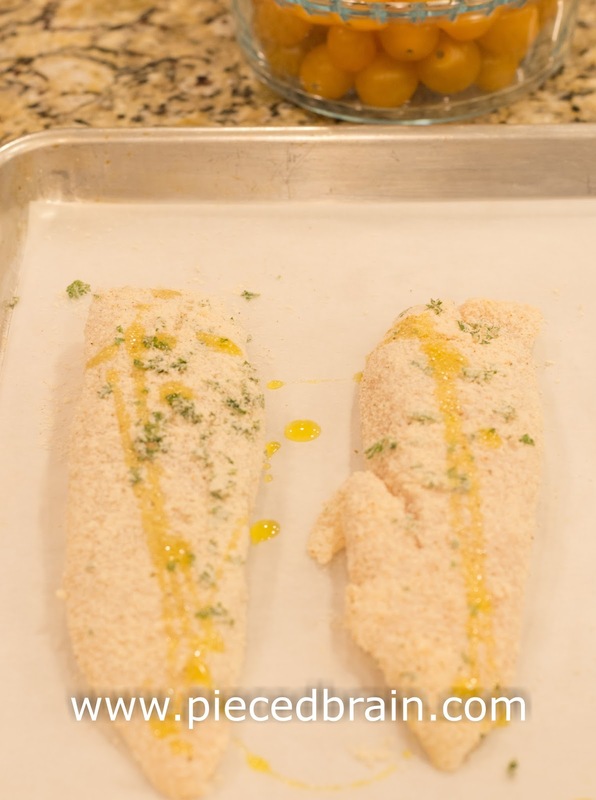 Place on a parchment paper-lined baking sheet, drizzle with olive oil and bake until the fish is opaque in the thickest part, 10 to 12 minutes. Serve it with the lemon wedges. Preheat the oven to 400 degrees Fahrenheit (200 Celsius). Arrange asparagus in one layer on parchment paper-lined baking sheet. Drizzle with olive oil, salt, black pepper and cumin, and bake for 10-12 minutes. Place washed sweet potatoes in microwave and cook them for 5 minutes. Turn them upside down and cook them for another 5 minutes or until tender when you test them with a fork. Cut them in half lengthwise, sprinkle brown sugar and dot them with butter before serving. I snapped this picture in a hurry because my mouth was watering to eat all this goodness, and I wanted it all still warm! You've got to give it a try - delicious! Perfect for when you plan to sew all day and still want to have a yummy (and quick to make) dinner. Thank you, I've got to try this one with my brood! Great recipe!I will use it tonight. Thank you. You made me laugh because I put cayenne in a recipe instead of cinnamon! That was a mess! haha. Do you think the recipe will be just as good with Crappie? We have a freezer full! LOL And I thought sweet potatoes had to be baked all day in an oven. Microwave? really? I'll try it!